Despite my waning interest in Marvel's comics' comic-book universe they still get me with a few things to keep me coming back. While I'm not really impressed with the new run of Venom, these recently released upcoming Venom-ized variant covers for all their monthly books are pretty damn cool. 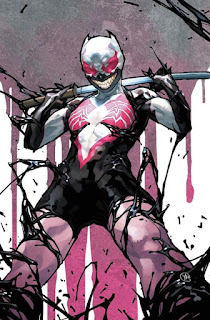 I mean, just Yasmine Putri's Gwenpool is downright superb. It's a brilliant use of Symbiote as costume, with the Gwenpool flair of shorts. The black, white, and pink color scheme works perfectly, and the whole image flows nicely. Very awesome job to Yasmine Putri on this! The Ghost Rider is one great, Spider-Gwen's is a cool design, and the Squirrel Girl has the Symbiote on Tippy Toe. It's nice they put it on the supporting character instead of the main, it gives a little bit of an added punch for interest.